The article headline here probably caused your eyes to widen. Dark chocolate, a weight loss food? Dark chocolate is a favorite treat of many. But not all dark chocolate is created equal. And, dark chocolate is not meant to serve as a meal replacement. However, if you’ve got an uncontrollable sweet tooth and you find something like the Whole 30 or ketogenic diet is incredibly hard without getting your hands on some chocolate then I’m going to show you how to add it into your diet to assist in weight loss. I’m serious when I say dark chocolate isn’t meant to be a meal replacement. However, if you’re imbibing in a rich, high-quality dark chocolate, then mixing it into your diet could have some positive benefits on your waistline as well as your health. Dark chocolate in its purest form is nothing but unadulterated cocoa powder. Cocoa comes directly from cocoa plants in the tropical regions of Africa, South America and Asia. Cocoa is one of the most potent sources of antioxidants, high-quality fat, and polyphenols on the earth. Yet hardly anyone would ever consider eating raw cocoa because it doesn’t really taste good by itself. Since no one’s going to eat pure cocoa, I’m going to give you some advice on what kinds of chocolate to eat at the end of this article. But before I do I’m going to show why dark chocolate (cocoa) is actually a supremely healthy food to add to your diet. I’m a huge proponent of eating clean, healthy fats. As an advocate of the ketogenic diet, I think 65%-75% of your caloric intake daily should be in the form of healthy fats. This is why it’s OK for those on a ketogenic diet to sneak an ounce or two of dark chocolate into their diet every few days. Dark chocolate fat comes from cocoa butter, which is made of the same cocoa plant the cocoa in dark chocolate comes from. While the exact makeup of fats ranges depending on the kind of chocolate, for the most part cocoa butter is mainly oleic acid (a heart-healthy monounsaturated fat also found in olive oil), and then smaller amounts of stearic and palmitic acids. Both stearic and palmitic acids are forms of saturated fat. And while there’s some research linking stearic and palmitic acids to elevated cholesterol, most people don’t need to worry about the amount found in chocolate as research hasn’t shown them to have unhealthy effects on your LDL cholesterol level. *while palmitic acid does have a slight effect on LDL cholesterol levels, it’s only 25%-33% of the fat found in chocolate, so if you’re not eating a lot of chocolate it’s not a major concern. Not to mention the other fats found in chocolate have been shown to positively affect the health of your heart AND can help your body run in a ketogenic state, which have huge stated benefits (please see this article on how the ketogenic diet helps you lose weight if you’re not already familiar with it). One of the best ways to lose weight is to reduce how much you eat. And one of the easiest ways to eat less is to put the reins on your appetite. The good news is dark chocolate may help with that. There are three hormones involved with your appetite; insulin, ghrelin and leptin. Studies show eating dark chocolate may help to bring these hormones under control which could help your appetite remain under control. 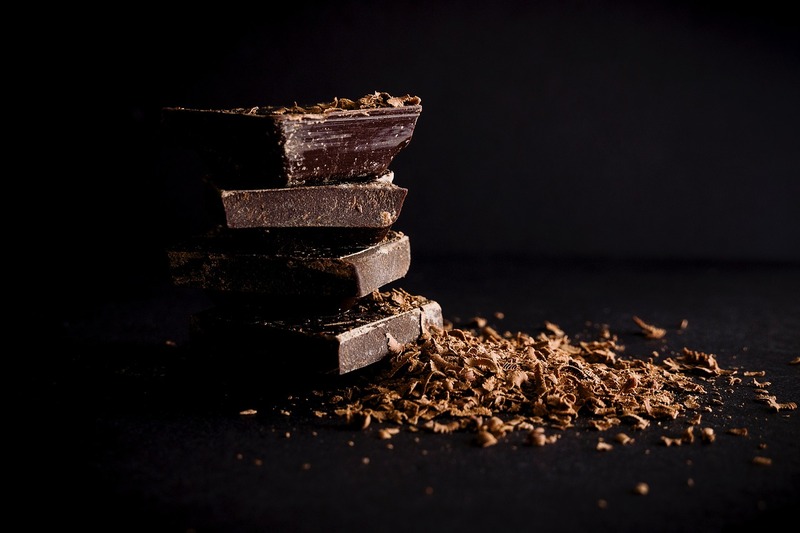 Dutch researchers performed a study about how dark chocolate helps people become more sensitive to insulin while also keeping levels of ghrelin in the health range. Eating it will also help control appetite as it’s high in fat which will lead to a feeling of satiation which can help minimize hunger pangs. Antioxidants have a wide range of effects on health, and it turns out that chocolate may be one of the best sources of antioxidants in the plant world. Cocoa has one of the highest scores of antioxidants (measured in ORAC) around. The incredibly high ORAC content produced by dark chocolate comes from polyphenols, flavanols and catechins, which are all known to have high antioxidant activity. One study showed that cocoa had more antioxidant activity, polyphenols and flavonoids than any other fruits tested, which included blueberries and acai berries. So while it’s not related to weight loss directly, the truth is eating dark chocolate regularly is a great way to introduce a high amount of health-promoting antioxidants into your body quickly. What’s The Best Kind Of Dark Chocolate To Eat? As I said earlier, the best kind of chocolate to eat is pure cocoa. But I know no one’s actually going to take that advice seriously. This is why I recommend getting chocolate that is both high in a cocoa percentage; I like ones that are 88% or better, and has no added sugar or very low amounts of sugar. I recommend organic and fair trade too, as the chocolate industry has been shown to be rife with unethical purveyors of chocolate. If you have a Trader Joe’s in your area, they carry a Midnight Dark Chocolate that is 100% cocoa and no added sugar. It’s kind of bitter but it’s easily the darkest chocolate you can find. If you’re using chocolate for baking I recommend one that is high in cocoa content and is sweetened with natural, 0-calorie sweeteners. KNOW Foods Better Chocolate Chips are a good example of the kind of chocolate chip to cook with. They’re sweetened with Allulose which contains 90% fewer calories than an equal weight of sugar and is not recognized as a carbohydrate. KETO FRIENDLY & LOW CARB: Containing 0 net carbs and only 40 calories per serving, KNOW Foods Chocolate Chips provides a delicious, guilt free alternative for goal-oriented diets including Low Carb, Paleo & Keto. GLUTEN & SUGAR FREE: KNOW Foods Chocolate Chips are low calorie, sugar free and gluten free making them a healthy alternative. SWEETENED WITH ALLULOSE INSTEAD OF SUGAR: KNOW Better Chocolate Chips are sweetened with allulose, “the sugar-free sugar”. Found in nature in things like figs and maple syrup, allulose has only 1/10th the calories of cane sugar, and none of the blood sugar impact. CLEAN, REAL FOOD INGREDIENTS: Made with real food ingredients, there are no artificial sweeteners or colors, sugar alcohols or cane sugar. Always natural, Non-GMO, Grain Free, Gluten Free, Wheat Free, Dairy Free, Soy Free and Yeast Free. Could Wine Help You Drop Stubborn Belly Fat?